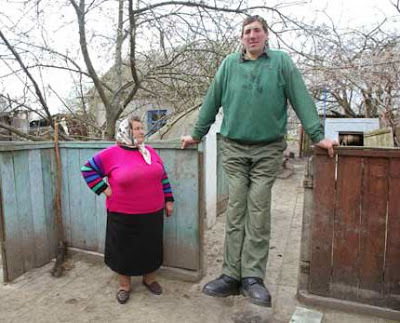 Ukrainian Leonid Stadnik 37, a former veterinarian, is eight inches taller than the former titleholder, China's Bao Xishun, who measured seven feet nine inches, Guinness World Records spokeswoman Amarilis Espinoza said in London. Stadnik's growth spurt started at age 14 after a brain operation apparently stimulated his pituitary gland, which produces the human growth hormone. Leonid is a very modest man indeed, he has intentionally feigned being measured by the Guiness Book of Records largely because he has not desired to be in the limelight and sincerely did not want the world's media focusing on him. He lives with his mother, Halyna, in northwestern Ukraine, taking care of the family's house and garden. According to Guiness, the tallest man in medical history was Illinois native Robert Pershing Wadlow, who was 8 feet 11 inches and died in 1940 at the age of 22 (coincidently Leonard's shoes are size 22).